Will Dutrow wheel Rising Moon back in 7 days? If he does bring him back he is a very likely winner in the Brooklyn. Rising Moon won for fun yesterday. With the combination of 2nd off layoff form and proven twelve furlong ability he has every right to win with ease in the Brooklyn. He is a more likely winner than his more famous stablemate the next day. The barn was down on this horse as he opened up at 2-5 yesterday. The owner flew in from some foreign country and was on-hand in the paddock. Judging by the opening price it looks like the groom, Dutrow and the owner cashed some big win tickets. The horse was dappled, calm cool and collected through the whole process. Even the gallop out was strong. I found a nice lone speed wire2wire candidate at Belmont today at a inviting morning line price. #6 Raw Silk is the clear lone speed and should be clear and loose on the lead in this 9 furlong test. This filly crossed the line first in both of her two turn tests, today she switches back to two turns after she set a hot pace last out. Not only is the 9 furlong distance over the Belmont inner is very kind to speed, but she should get a breather all the way to the far turn. Top this off with the short field and a wire2wire score is on tap at a healthy price. She may be overlooked here, but I will be focusing on her. Casino Drive was schooling in the paddock at Belmont on Thursday. From my computer I was able to view the live feed from Belmont Park. He looked absolutely tremendous as he was walked around the paddock. Arched neck, shiny chestnut coat, mane flowing/whipping around in the wind and he was strutting his stuff like the alpha horse in the paddock. He looked like one bad colt to be reckoned with, he took one look at one of the claimers in the paddock and started whipping his tail around in disdain. . The only knock I could have on his appearance as maybe he was a little too fresh, he was whipping his tail, bossing around the two handlers and generally just doing as he pleased. How could anyone with a pulse not be looking forward to the showdown next week with Big Brown? It is clear that this showdown will start in the paddock, with Big Brown and Casino Drive both vying for alpha horse control. Rick Dutrow is the kind of guy that reporters dream about. He is animated, honest, candid and has a colorful past. This is a guy that could fill a newspaper page everyday. He could sell papers like hotcakes and captivate the public's imagination with his polarizing comments. Yet the press is not satisfied with just reporting on him and his barn. They have to forage for dirt. They could write a story about how he brought his horse Rising Moon off a year layoff for a rousing win but they do not. They could write a story about how he has claimed horses with his own money and retired him to the farm, but they do not. They could write about his tremendous horsemanship skills, gleaned over a lifetime of working with horses. Instead they choose to rehash sensational, painful stories about the horrific murder of his girlfriend. Over and over we hear about his 70 odd infractions of the last 30 years. This is his time and he the man of the moment, who are these people trying to take his moment? Some say Dutrow is classless or crude. Isn't trying to bring him down at a time when he is completely validating his horseman skills classless? Dutrow may be a bit of a sneak but being a bit sneaky is not only part of the trainers job description it is a very desirable trait. The trainer from Seabiscuit was certainly sneaky, working his horse out in darkness to avoid scrutiny. This may have been an endearing trait for Tom Smith, but it not endearing for Dutrow, as he is labeled a cheat. Horse trainers should not be confused with high school guidance counselors or mistaken for the eastern region director of process improvement or some other position where you have to dress up, stifle your personality and shut up. A stable operates in secrecy especially a claiming stable where the bottom line is affected by the looseness of lips and conversely the braggadocio that helps scare away competition. It is Dutrows job to give his horse every edge he can muster. Sometimes brash comments may discourage a contender from entering a race, sometimes it may get a tired horse claimed. Dutrow is master of all things braggadocio and it seems to either endear him to people or completely turn them off. One thing for sure almost everyone has an opinion. Dutrow owns a trifecta of headline grabbing personality traits. The guy has brass balls, panache and a transparent personality. In a world where everyone says the same thing while saying nothing, Dutrow says everything and anything that comes to his mind. He can be funny, bold , rude and animated. He is the kind of person that makes the headlines that racing needs to stay in the limelight. Dutrow's personality trifecta is in short supply in racing, where many can be a complete bore. (2007 eclipse awards show expect for the steeplechase owner) Does Dutrow's candor make a classless person? Since when does boring equal class? Does Dutrow's personality make him classless? Or is it that everyone else has a sensitivity problem and can not take hearing the truth? Is the entire world at a dinner party with the Queen Mother at all times where the strictest of manners and protocol applies. There is a time for polite conversation and a time for discretion. However there is also a time for brash, bold comments and the racetrack is the perfect place for the comments that Dutrow makes. He is a breath of fresh air in this new backstretch world of political correctness and bland, vapid personalties. He injects personality and a bit of controversy where there was nothing. Dutrow is a throwback to the game of old, a direct link to every trainer that had to scratch and scrap to keep horse going to keep the food on the table. He is his fathers son who was a master trainer in his own right. Now that old line of claiming trainers is back on top. Every comment from Dutrow is played like a poker hand, every move designed to bluff, to intimidate or draw in his competition for the kill. There was a time before Go Baby Go when the racetrack was a unapologetically a big boys place and a bad boys place. Sure there were upper class people at the track, but there were also gamblers, drunks, bookies and loansharks. Dutrow would have done just fine at the racetrack of old. Now his brash confident comments rub people the wrong way. They are not used to Dutrow's raw, unbridled confidence and demand the homogenized trainer speak they are used to which is somehow mistaken for class nowadays. His comments polarize the public and those that do not like him must not only hear what he has to say but they feel compelled to comment on what he has to say. Bashing Dutrow is a common occurance, it is almost as saying something bad about Dutrow and his past somehow makes you a better person, he is almost universally disparaged. If these people looked closer at Dutrow, and considered the historical context of the racetrack, I believe they will realize their folly. Another guy taking a beating in the press is IEAH chief Iavarone. This guy went from pushing penny stocks on the Island to the top of the racing world. Learning about Iavarone's background makes the IEAH accomplishments all the more impressive as he is clearly operating on pure talent and panache. He picked Big Brown out of a maiden turf race and outbid the sheik and everyone else that wanted him. It was Iavarone that saw Big Browns brilliance in a turf maiden and it was Iavarone who had the stones to bet big on him off that turf win. Iavarone is certainly no blueblood, but he is not street trash either. Street trash does not slap together the most successful stable in the country in just a few years. Not only is his stable a classic race winner, they are Breeders Cup winners and Dubai World Cup card winners too. He certainly had to fight, struggle, plan, take risks and persevere to get where he is today. Having the sand to take those risks have paid off in the biggest of ways. Rather than give credit to where credit is due, most are foraging like roaches looking for crap to rehash from 1992, looking to cut the man down with his past rather than acknowledge the present. Then there is so much thinly veiled innuendo about the guy from the public and the press who has watched one too many Godfather and Sopranos episodes. What is the biases for this innuendo? Is it simply the vowel on the end of his name? What this guy has accomplished in this game is extraordinary, but few realize it. Anyone that has read about about some of the famous familys like the Kennedys, Bushes or house De Rothchild knows those at the top always have a few skeletons in the closet. The Kennedys started out as bootleggers and Bushes/Rothchilds have been war brokers for generations, all those with success are doers and doers do lots of things good and bad. Is a SEC violation from the early 90's and bad check really that horrible a transgression? Certainly the UCLA deception is embarrassing but Iavarone came clean about that. What we can all agree upon is that he has made a huge impact on racing. Unfortunately with that success comes the envy and the haters who always push their way to the front with attempts to defame and marginalize. Fortunately history is written by the victors and history will be written next Saturday. Commentator was a sight to behold in the paddock at the 2008 Met Mile. The gelding got a A+ in the looks department and a A+ in the "looking ready to run" evaluation. Even though Commentator is a chestnut his coat was dappled like the way a gray horse gets dappled, I had not seen such a healthy looking coat on a chestnut like that before. Commentator looked like he was at peak fitness and health. There there was the prancing and dancing, Commentator was on his toes in the paddock and prancing like the alpha horse. He looked ready and anxious to run, without the sweat and fractious behavior of a horse that is too fresh. He looked like a winner in the paddock. Commentator ran a great race on a suicidal pace. First Defense was all out pressing the pace and gave Commentator all he could handle on the lead. Commentator's bravest moment in the eight furlong test was when he lost the lead mid-stretch and looked to be out of contention. However with a surge of equine competitiveness he gamely regained the lead. Valor is admired and cherished but it does not guarantee a trip to the winners circle. It would not be Commentator's day as he was overhauled near the wire by the late closing winner Divine Park. Take nothing away from Divine Park but Commentator ran a very brave and inspiring race. Sometimes bravery is not rewarded in battle and Commentator was very brave in defeat. Judging by his success yesterday I am going to take a shot with #1 Volmoose in race #2 for trainer David Prine. There is not a horse on the backstretch that eats better. Time for a first and launch dual plays of the day. #4 Any Limit just raced a few days ago and had a bullet work on Friday. This is the Jerkens crackdown work that signals readiness in his steeds. Any Limit is second off the layoff and turf to dirt. Who is David Prine and how did he just put over a $146 winner? Very rarely do we see prices like that in New York. Looking closer at the connections it turns out that the trainer and his story is much more special than just a $146 winner. Not only was this the trainer's first winner it was his first winner. Halation brought elation to someone that could use a break in life. For David Prine, just being alive was something of a longshot. Nearly killed in a gas explosion in a Louisville, Ky. kitchen in 1999, paralyzed on one side and unable to speak, Prine endured years of physical therapy, cognitive rehabilitation, and several surgeries as he slowly learned how to walk again, and talk again. The only life he knew – that of being a chef – was gone, replaced by a legacy of suffering, trauma, and pain. Somehow, the long and tortuous road to recovery led him to the racetrack, where he toiled as a hotwalker, blacksmith helper, and groom. But on Saturday, Prine found himself someplace he’d only dreamt about – in the winner’s circle at Belmont Park, having saddled his first winner as a trainer with his very first starter, a 4-year-old New York-bred maiden named Halation, who returned $146. Three years after the accident, perhaps stirred by the memory of having worked as a hotwalker while in high school and wanting to reconnect with horses, Prine enrolled in Ted Landers’ course at Belmont Park on the principles of caring for thoroughbreds. He attached himself to a couple of blacksmiths. He procured a job working for trainer Steve Jerkens and also assisted Landers, himself a groom turned trainer. Along the way, Prine attracted the attention of Lois Engel, who in 2003 had purchased a farm in upstate New York with the intention of breeding and racing Thoroughbreds. By December, 2007, Landers was ready for a break. And Engel knew exactly who she wanted to take over training her horses. With her support and that of several trainers, Prine began studying for the state exam to get his trainer’s license. It wasn’t easy. Although he knew about horses, because of his brain injury, reading and writing remained a challenge. But with the same perseverance he demonstrated in coming back from his devastating injuries, Prine was able to master the requirements and pass the test with flying colors. Three weeks ago, he received his official license. And in Saturday’s fifth race, Halation came roaring from off the pace under Jean-Luc Samyn to win a seven-furlong turf event for New York-bred maidens. “It’s amazing,” said Prine, who Sunday will send out Volmoose, another New York-bred maiden. “When I was in high school, I thought about veterinary medicine, but I always had a flair for cooking, so I went to the Culinary Institute of America in Hyde Park, and became a chef. I worked at Tavern on the Green, the National Tennis Center, other places. These days, Prine, who lives pretty much on Social Security, takes the Access-A-Ride from his apartment in nearby Glendale to Belmont Park, where he spends most of his time in the back of Joe Lostritto’s barn at Belmont Park. Stabled there are three of Engel’s horses, including Halation and a filly named Mercy’s Image that he spoils rotten. Drawing on his background in the culinary arts and his own ideas about nutrition, the horses are fed three times daily – at 3:30 a.m., 11:30 a.m. and 4 p.m. – and routinely feast on Prine’s special blend of hay. Prine hasn’t given up cooking for people, either. After the September 11, 2001 terrorist attacks, he spent a month in the galley of the “Spirit of New York,” where he joined with other chefs and prepared food for the recovery workers at Ground Zero. On the backstretch, he cooks for the Anna House annual Christmas party and volunteers his services to other backstretch organizations as well. In all, says Prine, it’s been an amazing journey. Chad Brown the former Frankel assistant ships in #6 Victory sign who has a huge class edge on this field. Get down on this trainer before the secret gets out. This is Chad Browns first start in New York, this trainer is bred very well and this horse looks well meant first time New York second off the layoff. The owners of Triple Crown hopeful Big Brown Friday announced they would donate a portion of the colt’s earnings from the $1 million Belmont Stakes on June 7 to help a establish a scholarship fund for the young son of a Nassau County police officer who was critically injured in the line of duty. On May 18, a drunken driver with a suspended license slammed into Kenneth Baribault’s police car during a traffic stop the Long Island Expressway. Baribault had pulled over a sport utility vehicle on suspicion of drunken driving when the driver of a silver Mercedes, whom police said was drunk, plowed into the back of the police cruiser,. The impact pushed the police car into the SUV and lifted it six feet off the ground, according to witnesses. Baribault remains in a coma at Nassau County Medical Center, having undergone surgery to relieve swelling to his brain. In a news conference at Belmont Park, IEAH Stable owners Michael Iavarone and Richard Schiavo, both of Long Island, pledged to donate a substantial portion of whatever Big Brown earns in the final leg of racing’s Triple Crown toward college expenses for Baribault’s six-year-old son, Chris. Nassau County Executive Thomas R. Suozzi and Police Commissioner Lawrence W. Mulvey, both of whom spoke in front of the statue of 1973 Triple Crown winner Secretariat in Belmont Park’s paddock, praised the owners for their generosity. Big Brown, an impressive winner of the Kentucky Derby and Preakness, is the big favorite to win the 1 ½-mile Belmont Stakes and become the first Triple Crown winner since Affirmed swept all three races in 1978. He will be ridden in the race by Hall of Fame jockey Kent Desormeaux, who suffered a skull fracture in 1990 when he was kicked in the head by a trailing horse following a spill. Big Brown’s trainer, Richard Dutrow Jr., said the officer’s family has a standing invitation to come visit Big Brown in his barn at Belmont Park. “No one has asked that I know of, but they are welcome,” he said. Big Brown went to the track at 5:30 a.m. Friday and galloped for a mile and a half, said his regular exercise rider, Michelle Nevin. “He went for a walk through the paddock – it’s beautiful day for horses,” she said. The colt, undefeated in his first five races, is scheduled to breeze a week from Saturday, weather permitting. The Japanese racing fans are on their way to Belmont to see Casino Drive raid an American Classic. Thousands of them will arrive at JFK with their cameras, their hope and bags of yen to wager on Casino Drive. Their presence at Belmont is welcome and I hope the Japanese have a wonderful time in New York at Belmont Park. It is always nice to see interesting new faces at the championship track, where on a day to day basis it is the same die-hards over and over again. While the Japanese will likely feel welcome at Belmont, I doubt NYRA will be able to pull off hiring some Japanese tellers as this animal just does not exist in the local job market. 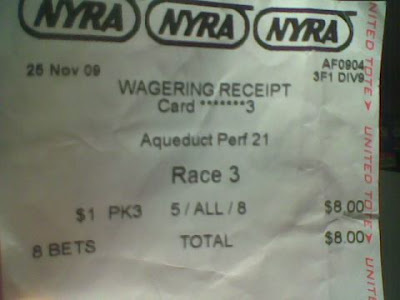 At this point NYRA is lucky to get English speaking tellers. So the Japanese will have to make due with the tellers we deal with on a daily basis, perhaps they could figure out the SAM machines. The Japanese will have to deal with a communication gap. The Japanese fans are here for one reason and they will bet the sashimi off Casino drive depressing his odds similar to Deep Impact at the Arc . Can you say 50,000 yen to win on number one? However the foreign pari-mutuel raiders will focus on the win pool exclusively as there is no teller in the house that will understand the Japanese words for pick 4 or pick 3, nor will the Japanese will be able to work such a complicated wager with unknown horses at a foreign place. Exploit this communication gap and go exotic if you want to play the exotic horse. If you want to bet Casino Drive focus on the exotics like the pick 3 and pick 4, he will be a better price in those pools than the win pool. Value will be your friend and value at the track is better than honour. Sometimes the Belmont is sort of a ho-hum event on the New York social calender. For most New Yorkers without the racing obsession, an organic food festival in Soho is more of a draw than a non-triple crown Belmont. However, with the triple crown on the line and the hyped Big Brown the star attraction, the Belmont Stakes hype has shifted into overdrive. You can get a pulse on the hype by checking out eBay. Tickets with a $100 face value are going for up to $600 each. There are dozens of listings for $2 win tickets on Brownie, some marked up to $15. Perhaps the best listing is a guaranteed triple crown from this ebayer. I love his spirit and how his listing is a gamble on to itself. If Big Brown loses you get your money back on the tickets, talk about a confident listing, only in racing could you see something like this. Not sure how this listing fits into ebays policy but in the spirit of Rick Dutrow, screw ebay policy do it your own way. The worst listing ranges all the way down to complete rip off. This guy is selling the unlimited $10 general admissions for $69. Anyone can walk up to the Belmont gates and get in for $10. Belmont is an expansive, beautiful place and the place almost can not sell out. There is no reason to get ripped off and pay some scoundrel $69 for what is $10, caveat emptor. 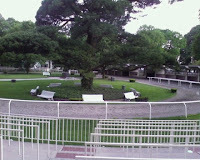 It is good to see the frenzy for the big day at Belmont, for me there is nothing like a triple crown attempt at Belmont Park, it is the most special sporting event in the world. The honesty of Rick Dutrow may endear him to some as a lovable rouge, but it has also stoked a mass epidemic of racetrack jealousy syndrome. At the racetrack any amount of success will bring a huge backlash. Any successful trainer is accused of juicing horses, or a handicapper that finds success will find themselves under the microscope to reproduce that winning form or face tremendous scrutiny. Steve Asmussen is a good example of racetrack jealousy syndrome in action He is criticized on the frontside by horseplayers as a trainer that "juices" his horses. Sure he has multiple violations but this guy starts thousands of horses per year and has a string at a half dozen racetracks in on both sides of the Canadian border. When you consider the scope of Asmussen's operation and the amount of horses he sends to the post he is not a frequent offender. This is like a car service operation getting more traffic tickets than a certain individual. Sure Asmussen taxi gets more tickets than Joe Blow, but Joe Blow only has one car while Asmussen manages a huge fleet a cars from Hudson River to the Rio Grande. The amount of success Asmussen has and the scope of the success from Toronto to New York to Chicago to Kentucky to Louisiana and Texas brings a huge amount of scrutiny and this is why Asmussen has a negative reputation in some circles. If Asmussen had no horseman skills could he have managed to bring the brilliant Curlin to hand? How did he do it in drug free Dubai? Dutrow is taking a beating in the press and on-line for the telling the Daily News that he uses Winstrol on his horses. While most trainers use steroids like Winstrol on there horses it has not been published in the press in plain English. Unfortunately Dutrow is going to be a victim of the fact that the public can not handle the truth. The public prefers to be lied to. The reaction to the truth will be to kill the messenger. While using Winstrol may be legal I can only recall one other trainer actually admitting its use to the press. The other I trainer that admitted to Winstrol use was was Allen Jerkens, the well respected chief himself uses steroids on his horses but I do not hear anyone bashing Jerkens or the many others that do the same thing. Why? Because only those that have massive success come under the scrutiny of racetrack jealousy syndrome. Dutrow is a victim of his own success, racetrack jealousy syndrome is a very real thing. It is a curse the rides right along side success. Here is a person that was at the lowest of lows and pulled himself out of the gutter to be a huge success in his field. He has risen from the gutter, to being a claimer trainer just a few years ago, plying his trade on the working class Aqueduct Inner meet, to the trainer that is on top of the world. Shouldn't people feel happy for him that god gave him a second chance and he capitalized on that chance to the maximum? Instead of admiring Dutrow for pulling himself out of the gutter, the racetrack jealousy syndrome has many people trying to drag him back down. They pigeonhole him as a trainer with little to no horseman skills. If his only skill was juicing horses how does he win multiple Group I's in drug free Dubai with Benny The Bull and Diamond Stripes? People do not appreciate his honesty, his candor and his genuine personality and use it against him. They only resent his success and want to see him crawl back into the gutter by using his past against him and denying the present Here is a guy that has risen like the phoenix and almost nobody can recognize the redemption before us. Racetrack jealousy syndrome has reached epic proportions. The way the triple crown sets up this year is strait from a storybook. The drama has been unfolding around us in between the lines of the racing form. The undefeated winner of the Kentucky Derby demolished the field, in fact his nearest competitor suffered mortal injuries chasing him home. If he was a boxer would you want to face him if his last competitor died in his last bout? One one from the Derby dared to face him in the Preakness. His win from the twenty spot was a complete validation of his undefeated form and established Big Brown as a rising force. The Preakness was a pure runway, it was the easiest of winners "as the rider pleased", nobody even coming close to the Brownster. Perhaps giving him the easy race he needs to pull off what has not been completed in thirty years. Standing in his way is the ruling family of Belmont, blood is thicker than water and the Better Than Honour family has been assigned the role of protecting the integrity of the triple crown. There will be no walkover in Elmont as Casino Drive is representing the Better Than Honour Dynasty. Casino Drive's role is to make sure Big Brown receives a proper test before the triple crown title is issued for the first time in thirty years. If Big Brown is not up to the twelve furlong test of a champion, the Better Than Honour Dynasty will rule for at least another 365 rotations of the earth. The meeting in the Belmont paddock looms. Big Brown toyed with this field like a Grade one winner would toy with a field of Charles Town non winner of two lifetime claimers. Big Browns romp was a draw dropping performance. There can only be two reactions to this type of race. Absolute awe in his breathtaking efficiency of motion or complete rejection of the horse and everything he stands for. These is no "he is okay", this horse and his connections are polarizers and that type of emotion is good for the game. The Belmont is shaping up to be a major event, perhaps the sporting event of the year. Between the looming hope of a triple crown winner and the international presence from Japan the attendance record of 124K in 2004 may be in jeopardy. Is Overbreeding to Native Dancer Responsible For All Of These Breakdowns? Very interesting article by William Nack on the overbreeding to Native Dancer and how that is causing so many breakdowns in American racehorses. They just may be on to something, so I did some work on pedigree query researching the pedigrees of every high profile breakdown victim of the last few years. Every single one of them had multiple crosses of Native dancer in their pedigree, representing massive inbreeding. It inspired me to take a closer look at pedigree and breakdowns. On the flip side I did some research on some of our old warriors. The iron horses that have campaigned year after year, virtually injury free. Out of a selection iron horses like Evening Attire, Spooky Mulder, Naughty New Yorker, Broad Brush, Say Florida Sandy and Arromanches only Broad Brush is free of Native Dancer blood so it is very hard to even find a horse out there without the Native Dancer blood. However most of the old warriors are not inbreed to Native Dancer like the tragic breakdown victims Eight Belles, Barbaro, George Washington, Mending Fences, and Pine Island. Most of the old warriors had balanced pedigrees with sound influences like Damascus well represented in the pedigree. On a similar note there is the offspring of Unbridled and how it relates to Eight Belles. On youtube they have the ABC pre-race coverage of the 1990 Belmont Stakes available for viewing. It it an interesting watch as you can catch a glimpse of the game before drugs like Lasix were legal everywhere. Before the Belmont Stakes the hosts of the coverage openly doubt the favorite Unbridled's ability to race in New York due to the lack of lasix in New York. At the time New York was the only triple crown jurisdiction to restrict the use of lasix. As they hit the 3/8th pole Unbridled spit the bit. Did he spit the bit because he could not race on his anti-bleeding medication? The horses effort was completely unlike his derby triumph 5 weeks earlier when he had the benefit of lasix. Unbridled is of course the Sire of Unbridleds Song who retired unsound early in his three year old season and is the sire of Eight Belles. Could this be a case of a unsound, drug addicted sire passing his unsound genetic DNA to generation after generation? My most prominent wish for the Preakness is that all the horses return to their barns ambulatory and safe. Never before have a felt like this before a horse race. It is like the game of racing is carrying a Ming vase while crossing a tight rope, fighting a strong crosswind with a huge crowd watching every move. If racing breaks the Vase public opinion may damn the game to exile, like fringe sports such as dog racing or Jai-Alai. Despite the promises of many not to watch racing, I am sure the Preakness will garner a huge TV audience, fueled by the headlines of Eight Belles breakdown, people will be very curious to see what happens in the Preakness. Should tragedy strike once again, it would be like racing broke the Ming vase they promised to carry to safety, the uproar will be deafening and certainly understandable. The public is losing patience with horses breaking down on TV. The Preakness axis of attention centers around Big Brown. He is of course a prohibitive favorite to win. I will be rooting for him to win to set up a huge showdown at Belmont. Racing needs redemption and Big Brown and his connections can redeem the game with a few more wins and doing the right thing with the horse and his campaign. IEAH has taken a beating in the media but it is not justified. So far they have been nothing but successful in a very tough game. Perhaps they are victims of racetrack jealousy, and having names that end in vowels. Hopefully they do right for the game. Like Washington Irving would, I will be making a few bets on the New York Bred Icabad Crane. Hopefully he can figure out a way to finish off the exacta as Big Brown romps to a commanding victory. Mostly I hope they all come back safe. In the wake of the Eight Belles tragedy, the masses have learned to make an association between horse racing and animal cruelty. 38% of Americans questioned a a gallup poll support baning Horse racing. The association between racing and cruelty has spread fast on the heels of the publicity generated by the triple crown races. Soon going to a horse race will be the social opposite of buying organic food from whole foods, it represents greed, cruelty to the environment and not feeling good about yourself and your consumer purchases. Interesting read over at the Daily Mail from the UK. The interesting part was all of the American posters on this article on horse racing basically said the same thing over and over again. It looks like some of the European posters have learned some of these lessons too. Like Pavlov's dogs answering a bell Americans seem to give the same reaction over and over again when the subject of horse racing is brought up. Looks like racing has made it's way to the same list as child abductions, Nazi's, the war in Iraq, terrorists and high gas prices. Just go against any of these things and you can instantly claim the high moral ground and feel good about yourself fighting the good fight while giving no effort to the cause and knowing absolutely nothing about what you are talking about. Racing now generates a response or more of a reflex that it is "all about greed and human entertainment". It is the same response over and over again. While it is certainly valid to feel empathy towards an animal in distress these people are not showing empathy, this is something different. They are saying I am better than you because I do not approve of an activity where a horse can be hurt, you are a disgusting, greedy, animal abuser for liking horse racing. Publicly denouncing racing on the internet or the water cooler is the new and hot way to feel good about yourself. While I hate to see racing dragged through the mud like this, I do hope this black eye on racing is necessary to bring about positive change. I don't like horse racing. I couldn't care less if it is the sport of kings or traditional. It is hard on the animals. But no one cares since it brings in millions. Makes me sick. Poor horse! I'm so glad she was uninjured! Horse racing and shows make me so sick for the animals. They run such a terrible risk of injury and are often put down when that happens. It's simply disgusting. First the Derby, now this. Poor animal. Even though she is okay, it is cruel and inhumane to continue with races. It's all about greed and human entertainment. The old warrior Tuffy Attire got up for place money at Belmont in the one mile and a half Fit To Fight stakes. He was a dime away from being the longest shot on the board and after a few races where he did not run so well he did not look like a likely winner on paper. Once again he broke five lengths last and trailed early. Commencing a rally on the turn Evening Attire passed everyone but the lone speed winner, who got away with a completely easy lead. This horse has many devoted fans and watching him run today was one of the highlights of the day, horses like Attire are one of the best parts of racing. If the people that are calling for the banning of racing would get to know a beloved old campaigner like Evening Attire perhaps they would attain a more informed opinion. In the tradition started by Secretariat, and repeated with Point Given, War Emblem, Smarty Jones, Afleet Alex, and Street Sense, Big Brown triple crown race winner is going to be retired during or after his three year old season. For the fans this is no surprise but it is yet another bummer for the game. While Secretariat had the decency to finish his three year old season, it would not be much of a surprise if Big Brown retires after the Preakness if he loses the race. However I am suspicious that he may retire after the Belmont regardless of the outcome as he has built up his reputation to gargantuan scale, why soil it by exposing his lack of foundation. The way horses are typically campaigned these days is sort of like building the facade of a beautiful castle, a castle so grand and exquisite that it elicits ewes and ahhs from all that see it. However the foundation is non-existent and the interior is barren, so why invite the smitten crowd in to see the interior of your castles facade? Sell it while the crowd is in mid ahh and the stock is at its paramount. While most of us can see through this charade and would surely want to take a look inside before investing, why is the breeding and auction industry so smitten with these facades? My question is why do horses like this do well at stud? Their form is so thin and such an insult to the game, it is almost like a mirage, without any foundation or soundness. This is like buying a car that could go zero to sixty in 3 seconds but is likely to completely stop running a mile from the dealer. Sort of like a 1986 Yugo with a Ferrari V12 engine. Yet these completely unsound "cars" are what are in vogue in the horse auction business. This proves that money and long term smart thinking does not necessarily go hand and hand. Are the managers, owners and buyers of horses really this foolish to breed to horses with known confirmation/soundness issues? Hopefully we will soon cycle out of this short term thinking as a new generation emerges to take stewardship of the game. Are the masses really this dumb? Since the Eight Belles tragedy a whole lot of people have come out of the wood work to comment about racing. Now that we have heard what they have to say it is a bit laughable how the complexities and vague questions associated with racing stump the average sports writer. The sportswriters are better than the internet commentators who are woefully misinformed. While the temporary presence of the masses may be helpful to initiate much needed change their constant presence would be annoying. (maybe good for the parimutuel pools though) Here are the top three articles representing the clueless. However the most laughable comments are available in the comments section of many articles. The last offspring of Seattle Slew in training has returned to New York. After nil success in California on the synthetic track he is back in New York with John Hertler. While John Hertler is a capable trainer who is well respected, there is someone else who might be a better fit as the trainer of Council Member. Wouldn't it be nice if William Turner and the Taylors could bury the hatchet and Turner trained the last son of the triple crown winner that he trained? One of these days Council Member is going to catch a massive speed duel up front and run them all down. Take a peep at the condition book and see that Evening Attire is nominated for a twelve furlong overnight stakes race. Evening Attire is a true favorite and he usually wins a race every so often. At ten years old he is an anomaly on the world of racing. An iron horse who still runs in stakes company at ten years old while most stakes horses retire during or after the three year old season. The horse is the star of the barn and is loved by everyone from the groom to the trainer to the owner to his adoring fans. He really is a creature that is loved. Here's to Evening Attire, I hope he runs his race on Thursday and comes home safe again. This is a horse who is beloved on the backside and frontside. Wouldn't it be nice if the outside world noticed how much a horse like Evening Attire is loved? Between the lack of experience, the lack of seasoning, the long ship to a foreign country and the layoff that was a very impressive win for Casino Drive. Casino drive is a serious horse, possibly as good or better than his classic winning siblings. The horse proved me wrong. This son of Better Than Honour will make the Belmont a very intriguing race, I hope that JAL reservations is ringing off the hook with Japanese race fans booking the NRT-JFK non-stop to see the Belmont. I hope the Japanese Elvis Yutaka Take take one of these NRT-JFK seats and ships in for the Belmont to ride. The Peter Pan is especially interesting this year. There is a ton of hype on a set of foreign horses. The connections of Casino Drive and are completely overestimating the breding factor trying to win the Belmont off a 2 race career. At the very least Casino drive is sure to need this race. While we know a half sister and half brother of Casino Drive won the Belmont, however the breeding is not going to overcome a complete lack of seasoning or experience. It looks like Casino Drive will be the favorite here off all the hype and has only a small chance to win the race. The second choice is another foreign runner, the horse from Peru Tomcito, who is yet to run a winning race in this country. While we were looking forward to Tomcito coming to New York he has not lived up to the hype. There is the memory of the Florida Derby with him toiling twelve lengths behind the winner unable to make up ground with his legs paddling upstream like a Mississippi river boat. It was not a pretty sight. With the first two choices in the Peter Pan vulnerable horses the whole theme of the Peter Pan should be bet against the foreigners. Value looms in this race. The legitimate contenders are Golden Spikes, Ready's Echo and Cosmic, all well bred dirt horses from class connections. With the hype horses garnering the majority of attention a fair price will be available on the true contenders, especially in the exotic pools. Golden Spikes chased Recapturetheglory around the track in the paceless Illinois Derby and should be stronger in the lane today after a string of nine furlong races. Ready's Echo had that flashy race up at Saratoga where he closed like a rocket after being left at the gate. Then Echo was able to close off the layoff in the uphill quicksand at Keeneland, he could be something special. Cosmic is bred well and has proven effective at the distance and in form. Box those and use them in the multi-leg exotics for a value infusion. In the wake of the Eight Belles tragedy, there has been a tremendous amount of talk about the safety of racing. Some of the talk has been moronic, uninformed while some has been on-point. It is important that some changes are made at this time while the spotlight is on racing and the game has tremendous public opinion leverage. The changes must be realistic and directly effect the results while not causing any undue economic harm to people that are struggling to make ends meet within the industry. Over at Paul Moran's blog Mr. Moran posted a letter from a fan that was completely on-point and I would like to echo that fans sentiments here. Ross A. Fowler really got it right and I hope his letter becomes the axis of change in the industry. The focus in the wake of the Eight Belles death should be on banning all raceday medications and a focus on safer dirt tracks. These are workable areas where the industry can affect real change. Safe dirt surfaces exist. This wheel does not need to be re-invented. At Saratoga the cushion is deep and it is rare to see a scene like the one we witnessed in the Kentucky Derby 134. If dirt tracks are maintained like Saratoga with a deep cushion and not compressed hard as a rock every time it rained, a safer surface would be a result. We all know it rained hard the day before the Derby and the morning of. The track maintenance crew was out there sealing Churchill's dirt track down to a hard super-highway to make it impervious to the rains. When horses run over this hard super-highway we get Eight Belles type incidents. If Churchill had the most modern drainage system there would be no need to seal the surface every time it rained. The focus should be on, optimum drainage and a deep cushion. A sound surface is well engineered from top to bottom. We do not need slow synthetic surfaces with drugged up unsound horses toiling from wire to wire, in a unformful poly-procession. Dirt form has been established as the form of American racing and safe dirt surfaces are available if tracks have the knowledge and ability to install and maintain them. Poorly maintained surfaces like the old dirt at Santa Anita, Del Mar and Arlington should have been engineered with Saratoga as a model. They did not need to be scrapped for the poly-track band-aid cure with its empty promises of no maintenance and fewer injuries. Adding safer, deep dirt surfaces to existing tracks will protect the integrity of the horses legs while protecting the interest in the game. The second change that needs to be made is on raceday medication. The USA should adopt European medication standards and ban all raceday medication. Now is the time while the public sentiment is huge, the leverage is there to change the game. This is a realistic change that can happen soon. Most of the world races clean of drugs, with American horses racing on a mix of lalix, bute and who know what else we are the cesspool of equine substance abuse. The time is now to stop taking shortcuts and get back to fundamental horsemanship. The long term repercussions of drug abuse in the thoroughbred are beginning to dominate American bred thoroughbreds as generation after generation of drug aided inferior stock enter the gene pool. Stop the legal drugs and everything else will fall into place. Realistic change should focus on these two areas of concern. There is a wide range of nonsense out there concerning use of the whip, moving the triple crown to four year olds, synthetic surfaces and increasing the minimum age of racing to three year olds. These are all band-aid approach measures that ignore the core reasons of the problem. It is impossible to legislate the type of horses that people buy and mandate a market that focuses on sound stamina horses. However the NTRA and the tracks can legislate that horses run over a safe dirt surface and do so without any drugs in their system. This is real attainable change for the greatest game and it should be done now while the leverage is there. Very few people take pleasure out of abusing animals. Our furry friends are mostly innocent, honest creatures who bring tremendous joy to our lives. When my cat died last year my family and I cried for a week and I still tear up when I look at the collage of photos we display in his honor. When a person is revealed to be an abuser of animals the immediate emotional reaction is that person is a scumbag. Racing is being called a scumbag everywhere we look today. When people lash out at those that abuse animals it is a valid reaction. However it is not a valid reaction in this case as people with little knowledge are judging racing on the merits of a extreme incident and racing is a very polarizing game where things are always at extremes, good and bad. Larry Jones loves his horses. They receive the best of care and in return he asks for everything from his horses. Is he wrong to ask for everything? The fact of the matter is that thoroughbred racehorses receive the best of care on a daily basis. In return for asking for everything these horses receive daily baths, legs wrapped in lineament, a coat groomed and brushed to meticulous standards. There is medical care, legs are checked daily, the best food money can buy, daily rubdowns and rest when needed for top tier contenders like Eight Belles. The calls for the ban on racing are completely absurd. A closer looks reveals that the horses are like family to the connections and far from abused. It is a truthless statement is that these horses are abused on a daily basis. They are loved. We have many people completely uneducated on the most complex of games coming out of the woodwork and pointing fingers at the connections of Eight Belles. Do these people understand the daily life of a thoroughbred and the daily life of the trainer, groom, hotwalker and owner? Greed drives these people? What a ridiculous statement. The fact of the matter is that most owners lose money and are in this for the love of the game. It is truly the greatest game in the world. The life of a trainer is a life of hardship, early mornings, late nights of worry filled with complex lingering questions with vague answers. The trainer operates on a level of passion that would burn most people out in months if not weeks. The grooms have a life of poverty and hardship so extreme that most of not all Americans have opted out of this line of work, leaving it to the only people willing to do the hard work necessary to get horses ready to race, illegal immigrants. Are these people animal abusers who take pleasure in the pain of their horses? They are not animal abusers. It is very easy for Joe Sixpack and Jane Do-gooder to use carte blanche and claim the high moral ground by pointing the finger at those involved with racing. However these accusations made at the Eight Belles connections are invalid and without truth. What happened is unquestionably horrible and unfortunate. The fact of the matter is that it was more accident than abuse. Racing is a game where everybody gives everything. The owners risk their money on a dream and sometimes lose it all and usually lose most of it. The trainers forsake a normal life to be with the horses and do what they love. The jockeys risk their lives for the love of speed. The best horses like Eight Belles put it all on the line and they do it willingly. All for the joy of speed, the validation that comes with proving you are best, they continue with that game. Yes sometimes the horses do breakdown. Is it worth pushing these horses to extremes to extract the glory, excitement and triumph to endure a few scenes of horrible gore? I do not know. What we do know is that the racing is one of the finest strains of spectator pleasure when everything goes well. But if someone did not want to watch racing due to the small chance of witnessing a breakdown I can understand that. The entire game is a beautiful spectacle of nature. In nature it is the best that thrives. Racing is a game that reflects nature in its truest sense. To be the best in nature one must give their all, there is no society to protect mediocrity like the protections that people enjoy. Like in nature those that take the biggest risks in racing become boss. Some want to do away with racing for the ugly risks that are inherent with horses giving there all. Leaving us with no great game to follow and just some mediocre games to follow where people wear helmets, pads, complain and there is little glory, passion or excitement. Unfortunately where there is a overabundance of passion, adrenaline, speed and emotion nature extracts a cost. The glory, excitement and triumph is not free. Unfortunately on the biggest of stages a gallant filly who truly gave her all went over the edge in a ugly, gruesome and horrible way. Nature extracted a payment while a champion basked in all his glory mere yards away. My derby pick for the win bet is Court Vision. Big price, room for improvement and the Remsen was the "in traffic run of the year".